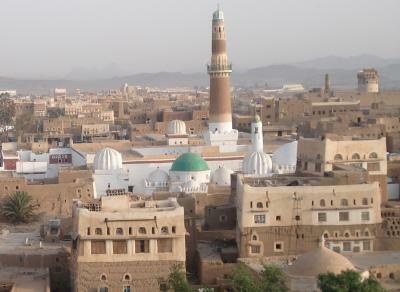 Executive Bureau in Saada province denounced the war crimes and massacres perpetrated by the Saudi-led coalition against the Yemeni people, the latest of which was the targeting of civilians in the border districts of Baqim, Razih, Shada, and Qitaf. This took place during a meeting held on Tuesday under the chairmanship of Saada governor Mohamed Jaber Awad. The meeting condemned the coalition’s bombing on the border districts, which killed six citizens and injured four others, in addition to the destruction of civilians’ houses and infrastructure in the district. Saada governor praised the positive positions of Hassan Nasrallah, Iraqi freemen, Syria and other Arab countries who expressed their condemnation and rejection of the Saudi-led war against Yemen. The meeting discussed the preparations underway to commemorate the anniversary of the “Sarkha” or the slogan in English, and the establishment of summer centers in the province. Meanwhile, Saada governor Mohamed Jaber Awad confirmed the importance of mobilization to confront the Saudi-led coalition.